Studies on Kiswahili in terms of speakers’ pragmatic strategies of politeness have so far only focused on standardized Kiswahili from the East African coast. However, apart from morphosyntactic contact-induced change, also pragmatic strategies among Kisangani-based Kiswahili speakers largely diverge from coastal speakers’ modes of interaction. Especially politeness patterns, as claimed in this paper with reference to speakers’ broad multilingual repertoires, are prone to pragmatic change, strongly influenced by politeness strategies usually associated with Lingala. Offering a first overview of the pragmatics of politeness in Kisangani Swahili, I primarily focus on face-threatening acts (FTA), third party face, concepts of shame and respect, self-censoring and also speakers’ ways of expressing criticism. Moreover, based on existing studies for ECS (East Coast Swahili), the pragmatic analysis of Kisangani Swahili includes a discussion of directives with specific reference to neighboring varieties such as Kivu Swahili, and also sheds light on the use of honorifics and terms of address in the language. Marecherche ku Kiswahili mu angle ya bya adabu ku benye banaisemaka inajifocalizaka ku Swahili safi tu, ile Swahili ya Tanzanie. Lakini, apart changement de langage induit na contact morphosyntaxique, na mastrategie pragmatique ku basema Swahili ba Kisangani, banapishana sana na mamode za interaction za basema Swahili Tanzanie. Spécialement modeles za politesse ngisi zinasemewa mu iyi article na maréférence ku macollection mingi za basema Swahili, ni ma mwanzo ku machangement pragmatiques, sana sana influencé na mastrategie za politesse zenye zinakuwaka associés sana na Lingala. Saa nilikuwa na pana synthèse ya kwanza ya pragmatique ya adabu mu Swahili ya Kisangani, milijifocalisé sana sana ku ma-acte zenye zinamenacé batu, ba-tierce-personne, na maconcept za haya na za adabu, na za kujichunguza mwenyewe na ginsi basema Swahili banacritikaka bengine. Tena, basé ku marecherche zenye ziko za Swahili safi, ma-analyse pragmatique za Swahili ya Kisangani zinainclure discussion ya madirective na référence ku mavariété za karibu karibu sawa vile swahili ya Kivu, lakini kupana mwangaza ku utilisation za heshima na materme za adresse mu luga. Studien zu pragmatischen Strategien von Höflichkeit von Kiswahilisprechern haben bisher meist das Standard-Swahili der ostafrikanischen Küste untersucht. Außer morphosyntaktischem, kontaktinduziertem Sprachwandel weichen jedoch auch zentrale Aspekte der Pragmatik von Kisangani-basierten Swahilisprechern von den in den Küstenregionen ansässigen ab. Insbesondere Höflichkeitsstrategien, wie in diesem Aufsatz in Bezug auf multilinguale Repertoires von Sprechern herausgearbeitet, sind anfällig für pragmatischen Wandel und stark beeinflusst von Höflichkeitregeln im Lingala. Als erster Überblick über die “Pragmatics of politeness” (Pragmatik, die sich mit Höflichkeit auseinandersetzt), untersuche ich vor allem “face-threatening acts” (FTA), “third party face”, Scham- und Respektskonzepte, Selbstzensur und den Ausdruck von Kritik. Überdies, angelehnt an Standard-Swahili, beinhaltet die pragmatische Analyse des Kisangani Swahili eine Diskussion von Direktiven in Bezug auf Nachbarvarietäten wie Kivu Swahili, und beleuchtet ebenso den Ausdruck von Ehrbekundungen und Anredeformen in der Sprache. 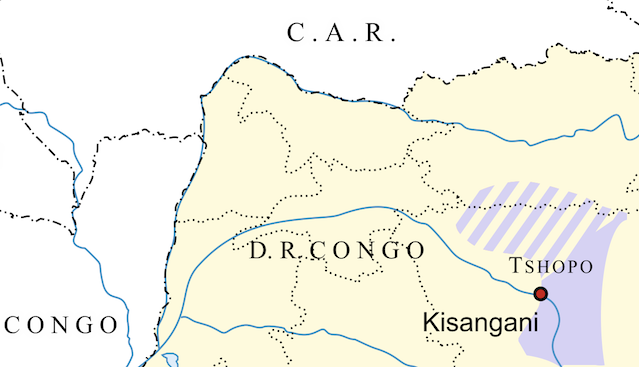 With an estimated population of nearly 550,000 inhabitants, Kisangani ranges among the largest cities of the DR Congo, situated in the country’s northeast on the Lualaba-Congo River, which divides the city into two parts. Over the course of its history, the city which was first called Falls Station, Stanley Falls, then Stanleyville, and only after independence from Belgium in 1960 eventually Kisangani, has been the setting of different dominant languages. Kiswahili began to play a part in the area from 1876 on when the Arab traders increased their activities in the region, and when local Wagenia people began to acquire basics of the language. Lingala, however, (formerly labeled Bangála) was mostly bound to the movements of the colonial military Force Publique under the Belgian Van Kerckhoven eastwards, with both languages meeting in the urban settlement of Kisangani not earlier than 1886 (see Meeuwis 2006:119-122). In the following decades, due to Bangála-speaking troops in the area, due to the decreasing influence of Arab traders and eventually after independence due to dictator Mobutu’s preference of Lingala over Kiswahili, the linguistic situation in Kisangani changed. Despite the fact that the Lingala-Kiswahili border (cf. ibid.) still separates the city of Kisangani into more Lingala-speaking vs. more Kiswahili-speaking neighborhoods (Wilson 2012, 2015, Nassenstein 2015), the course of this linguistic border has changed saliently over time (and is now bound to the rivers Lomami and Aruwimi according to Meeuwis 2006:126). In more recent times, the impact of Lingala as the most spoken language among urban inhabitants has increased due to its dominance in popular culture such as music, TV series and comedies, as well as based on its association as the (fashionable) language of the capital Kinshasa. This has led to contact-induced change in Kisangani Swahili, as described in more detail in Nassenstein (2015). Map 1 shows the approximate area where the Kiswahili dialect from Kisangani is spoken nowadays. The hatched areas mark Lingala-speaking areas where smaller groups of Kiswahili speakers can be found. Due to Kiswahili speakers’ intense language contact with Lingala in Kisangani over the past decades, their pragmatic patterns deviate to a great extent from those that are found in Kivu Swahili. Lingala, as the language of the Congolese army (FARDC), and likewise of its colonial predecessor Force Publique and also of the national police, is often described as a ‘very impolite language’, a ‘language without respect’ (see Wilson 2012 for similar associations, inter alia). This not only reveals speakers’ and non-speakers’ language ideologies, but it also suggests that apparently Lingala and Kiswahili have very diverging inherent (im)politeness patterns. Apart from the different politeness strategies that are employed by speakers of the two languages, face-threatening acts and speakers’ attenuating approaches to preventing FTAs (see Brown & Levinson 1987) also deviate to a great extent. In the present study  , an analysis of greetings, honorifics and politeness strategies, as well as a contrastive comparison of direct and indirect communicative acts, is provided in order to show that the pragmatic basis of Kisangani Swahili has been clearly influenced by Lingala, reflecting speakers’ broad communicative repertoires as well as Kisangani’s geographical situation between Kinshasa in the west and Goma/Bukavu in the east of the country. While numerous Kisangani Swahili speakers themselves claim to be influenced by a Swahili frame of linguistic politeness, thus identifying with negative politeness patterns, speakers from the Kivus would in contrast classify Kisangani Swahili speakers’ pragmatic frame as determined by positive politeness, as in Lingala (based on interviews with Paulin Baraka Bose, p.c. 2015, among others). Kisangani Swahili is prone to a variety of choices, which depend upon speakers’ ideologies and orientation. This also relates to pragmatic issues. More traditionally oriented individuals, among them university students, educational elites and elders, will adjust their taboos, swearing practices and politeness strategies towards Goma and Bukavu, while youths and individuals originating from lower social strata are more oriented to principles of language use in Kinshasa. Other than socio-phonemic markers (such as for instance the use of haplology) or distinctive morphosyntactic realizations (for example the different ways of constructing relative clauses), pragmatic patterns can barely be concealed in spoken interaction due to their ubiquitous prominence in every speaker’s utterance. Ways of apologizing, complimenting, criticizing, swearing, begging and thanking, all offer clear insights into the pragmatic foundations of a person’s linguistic self and are thus emblematic ideological markers, whether or not this is intended by speakers. One could therefore argue that pragmatic structures in Kisangani Swahili are to some extent prone to metatypy, when speakers use both Lingala and Swahili in daily life; this means that the pragmatic structures of one language have an impact on those of the other language (cf. Ross 2003). While this may be the case for some speakers, others are fully aware of their divergent and situationally applied politeness, depending upon the conversational partner, the setting of interaction and the topic addressed. The pragmatic patterns that speakers employ in their interaction therefore constitute core elements in variationist approaches to urban ideologies. Methodologically, the present insights are based on semi-structured qualitative interviews with speakers of Kisangani Swahili, in which core concepts relating to politeness (such as eshima ‘respect’ and adabu ‘good manners’, among others) were discussed. Especially group interviews could help in situations where both speakers of the adjacent (yet, very different) dialects of Kivu Swahili and Kisangani Swahili were present. While some interviews were carried out in the DR Congo, most of the research actually took place in Kampala (Uganda) in 2014 and 2015. Ever since Brown & Levinson’s (1978, 1987) groundbreaking framework for the study of linguistic politeness across languages (which can be considered the first exhaustive theoretical overview since Lakoff 1973), numerous other scholars have largely contributed to the focus on politeness theory in the pragmatic analysis of language (see Watts, Ide & Ehlich 2005 , Linguistic Politeness Research Group 2011, Leech 2014, just to name a few). The explicit study of ‘impoliteness’ in language use has also contributed to new insights into deliberate face-threats and rude or harsh language (see for instance Bousfield & Locher 2008, Culpeper 2005, 2011, Culpeper, Bousfield & Wichmann 2003). In the quest for a general definition of ‘politeness’, some scholars, such as Watts (2005:xv), refer to Lakoff’s (1975) statement that “politeness is developed by societies in order to reduce friction in personal interaction”, while others such as Brown & Levinson (1987) understand politeness as a specific behavior aimed at the softening/mitigating of face-threatening acts (FTA). According to Brown & Levinson’s (1987) model of linguistic politeness a range of positive and negative FTAs can be distinguished, which either affect the hearer or the speaker. Among the negative acts that are face-threats to the hearer are orders, offers, compliments and reminders, just to name a few. As positive face-threats to the hearer they list among others criticism, violent emotions, taboos and bad news. The negative FTAs to the speaker include giving thanks, excuses, acceptance of offers and responses to hearers’ faux pas, while positive face-threats to the speaker include for instance apologies, the acceptance of compliments, confessions and the non-control of emotions (see Brown & Levinson 1987:65–68). The main negative politeness strategies discussed by Brown & Levinson can be categorized as (1) being indirect, (2) making use of questions, (3) being pessimistic, (4) minimizing verbal impositions, (5) giving deference, (6) apologizing/asking for forgiveness, (7) impersonalizing hearer and speaker, (8) going ‘on-record’ in case of indebtedness (and some additional minor features). Among Brown & Levinson’s positive politeness strategies are (1) exaggerations, (2) the use of in-group markers, (3) seeking agreement, (4) avoiding disagreement, (5) using and raising presuppositions, (6) joking, (7) responding to the hearer’s wants, (8) offers/promises, (9) being optimistic, (10) giving/asking for reasons, (11) assuming reciprocity and (12) giving gifts, in the form of sympathy, understanding and acknowledgement (pp.101–211). While Brown & Levinson’s model has especially in more recent studies been adding to the existing theoretical framework, scholars such as Leech (2014:11) redefine the concepts by differentiating between ‘pos-politeness’ and ‘neg-politeness’. Meanwhile Culpeper, Bousfield & Wichmann (2003) have shifted from the five general strategies established by Brown & Levinson (negative politeness, positive politeness, bald-on record, off-record politeness, withhold politeness) toward a binary distinction between ‘on-record politeness’ and ‘off-record politeness’ by pointing out that ‘face’ is to be seen as the main focal point of classification in the study of politeness. The distinction between on-record and off-record therefore already includes positive and negative face. Yahya-Othman (1994), who has extensively studied politeness strategies among Swahili speakers on Zanzibar, comes to several conclusions that stand in clear contrast to the findings of the present overview of politeness in Kisangani Swahili. General deviations include the fact that the use of several languages with highly divergent politeness patterns (Lingala with positive politeness strategies vs. Kiswahili with more negative politeness strategies) in daily life in the same city leads to pragmatic convergence, and to the partial adoption of patterns bound to both languages through interaction. In the following, Kisangani Swahili speakers’ politeness patterns will be compared with ECS (based on Yahya-Othman’s study from 1994) and with Kivu Swahili, based on my own research findings. Salient deviations between Lingala speakers and non-Lingala speakers are for instance (beside very similar strategies when formulating questions, demands, when asking a relative for money etc.) communicative patterns within the family, where conversations are more freely held in Lingala-speaking households in terms of the directness of criticisms, loudness of interaction and the non-avoidance of specific taboo words. Some of these have, especially in the younger generation of Kiswahili speakers in Kisangani, been copied and adopted, and have molded a complex web of politeness which is often re-negotiated depending upon the setting and domain of interaction. Kiswahili-speaking Boyomais  therefore continually re-adapt their politeness strategies since they have vast knowledge of clearly positive strategies (bound to their knowledge of Lingala) but also more negative politeness strategies (due to the use of Kiswahili in the family context, etc.). The importance of a ‘third party’ is stressed by Yahya-Othman (1994) for speakers’ interaction in Swahili society. Face-saving strategies are often directed toward a third party in interaction, in order to regulate the balance of individuals within larger social networks, especially in strictly and hierarchically organized collectivist societies, where the group as a whole counts for more than the single individual. Scholars such as Brown & Levinson have therefore neglected the so-called ‘third party face’, which is of prime importance when dealing with Kiswahili politeness strategies. In Swahili society, the notion of ‘face’ is bound to the avoidance of shame (aibu, haya), which is a constant threat to the individual whenever certain pragmatic strategies are neglected or not realized according to societal standards. The loss of face is therefore not only an individual threat (as in western cultures) but more of a group threat due to the fact that the entire group is seen negatively when an individual that belongs to that group loses face. In contrast, in Kisangani the concept of shame (aya) and face-loss is limited to “la honte de la famille” [shame bound to family-related issues] but not necessarily related to other aspects such as verbal exchange about delicate topics in the street. This difference implies the conceptual distinction of a ‘private space’ (family-related issues, endangering the family’s face by causing aya, although these can also still take place in the streets, for instance) and a more ‘public space’ (dominated by Lingala politeness strategies and prone to tabooless interaction). The pragmatic choice as to whether positive or more negative politeness is required has effects on the public perception of the speaker, and also marks his/her identity. As already mentioned above, speakers’ choices are indexical and serve as expressions of their orientation and identity, indicating whether they orient themselves more toward the eastern parts of the country (Goma/Bukavu, the Kivu Provinces) or toward the (western) capital Kinshasa. On a pragmatic level, speakers’ choices are equally meaningful as on a phonological or morphosyntactic level and are subject to the complex negotiation of each individual’s public image due to varying perceptions of what is considered ‘polite’ or ‘impolite’ in society. Aya can be caused when youths do not greet an elder who passes them in the streets, or when somebody passing in his car unintentionally splashes water on some other person who in an emotional outburst calls him/her names. Surrounding passersby will most likely comment on this with “unafanya aya ya famille yako” [you are causing shame to your family], addressed toward the swearing person. In both cases, face-saving (or the restoration of face) can be accomplished when apologizing in person after the incident has happened. In contrast to Yahya-Othman’s observations on the East African coast, the concept of uso (‘face’, or the Kisangani Swahili equivalent buso) does not exist when referring to one’s public self-image in Kisangani, and neither does aibu (‘shame’). Yahya-Othman (1994) also discusses the phenomenon of kusutwa in her study, which she describes as the process of publicly being accused of being a liar by witnesses after having talked or gossiped about other people, and without having indicated the source of the story. This can stigmatize one’s face for a long time, and bring about the loss of one’s social status. In Kisangani, kusutwa does not exist, and what is called songisongi (Lingala, ‘gossiping’) or in Kiswahili kuchonganisa batu is neither taboo nor severely sanctioned, even if the source of the incident narrated is not made clear. This can be explained with the fact that songisongi is an established practice of social interaction at the corners of crossroads or on the grass strips of the large boulevards in Kinshasa, where neighbors exchange recent news, discuss all current developments in the city and also talk about neighbors, celebrities and others who are not present, often by exaggerating, adding information and flavoring the stories that they have picked up. This can be considered a strategy of positive politeness that contributes to the stabilization of networks through the open exchange of true and false news, where all participants are aware that not all of the news is based on true facts. Social media such as Facebook reveal similar practices, where groups such as Kisangani masoló (Lingala; ‘Kisangani conversations’) serve as a rich source for urban rumors, recent stories, the latest gossip and other news. Despite the fact that people’s (Facebook) names are indicated, the diffusion of false information does not lead to accusations of deliberately spreading lies. While Yahya-Othman points out that respect and politeness (heshima/adabu) has to be shown toward all members of society at all times on the East African coast, in Kisangani eshima (‘respect’) is bound to one’s background (Lingala vs. Kiswahili): somebody who grew up in a Kiswahili-speaking context is more likely to show adabu (‘good manners’) at all times, even when dealing with people from the lower strata of society such as beggars. This was described by speakers as “niko na adabu ju yake” [I show good manners toward him/her; have respect for him/her], regardless his/her social status, since adabu is more of a self-image (and how one shows himself/herself in public) than an expression of how one values others. This contrasts with people who have grown up in a Lingala-speaking surrounding, where eshima and adabu are not known or practised. Respect is mostly shown toward people of a certain status, with high societal prestige or people of old age but not necessarily toward beggars, street children or people with mental or bodily impairments. While other pragmatic practices such as the above mentioned songisongi have been adopted from the capital Kinshasa and deviate to a great extent from the East African coast, the realization of eshima and adabu depend upon one’s regional and linguistic background, and thus, whether one is a speaker of Lingala or Kiswahili. And despite all other merging of politeness strategies, these principles are often maintained and bound to the first language that one is socialized with in the family context. Young speakers of Kiswahili who learnt Lingala at a later stage and may use it with their peers or in a professional context will still stick to their understanding of adabu/eshima, despite other potential choices of pragmatic politeness such as using more positive politeness strategies in their interactions. The concept of ‘group face’ (also discussed by Yahya-Othman for coastal Swahili society) is equally important in Kisangani, both among Kiswahili and Lingala speakers. When mourning the loss of a member of one’s community, pain and grief has to be explicitly made visible through verbal and mimic action. If one remains unaffected by drastic emotional incidents, the public group face is threatened. Third-party face is, as already introduced before, an important concept in coastal Swahili but also in Kisangani. When trying to re-establish the face of a third party who has suffered face loss due to social sanctioning and in order to encourage the person to try his/her best to regain his social status by ‘repairing’ his/her face, the specific person is not addressed directly but the conversation (between first and second speaker) indirectly circles around the third party and mentions him/her, with the intention that (s)he should receive the message. Third-party messages are also used in order to attenuate the shame of an individual because each individual within a certain group contributes to the establishment and maintenance of ‘group face’. Moreover, third-party face is also saved when outsiders’ or strangers’ face is protected. Self-censorship is another strategy for preventing the violation of group face and is very prominent in Swahili culture. On the East African coast, when delicate topics are introduced or discussed, specific gestures, thematic changes and the use of deliberate inaccuracies help to save group face. Kisangani Swahili speakers make use of this principle, too, using several strategies when confronted with a delicate or embarrassing question. When a male speaker is asked in front of older or respected people, for instance, how things went with the girl he picked up the night before (“we na mwamuke, ilipitakana aye?”), the speaker will either (a) reply with laughter, showing that (s)he is not happy with the question that he was asked, or (s)he will (b) postpone the explanation (by saying “nitakuambiya nyuma, bakubwa biko apa” [I will tell you later, elders are present]), which is a possible choice even when the elders mentioned can hear that the speaker is avoiding the topic because of them, since they know that he is saving the group face by postponing the discussion of a delicate topic. Or, as a third alternative, (c) (s)he will eventually change the topic by encouraging the speaker (“sema maneno ingine!” [say something else! ]), which older or respected hearers will also tolerate since they honor his/her efforts to protect group face (as expressed by Trésor Alembe, Léon Moka & Marc, p.c. July 2014). The use of so-called innuendos or vijembe (‘razorblades’) is also a common feature in Swahili culture, when for instance criticisms are expressed indirectly (see Yahya-Othman 1994). When three speakers are together and older or respected hearers are following the conversation, group face is saved when A (the person criticizing) confronts speaker C with the criticism instead of the guilty speaker B. Speaker C will reply to the accusation, whereas B – although (s)he has fully understood the criticism – will pretend not to have followed the conversation, in order to attenuate his/her (h)aya (‘shame’), and in order to maintain heshima (‘respect’) and group face. In the case of Kisangani, the situation is slightly different since criticisms can also be addressed directly to speaker B, while speaker C then has the attenuating role, and is most likely to intervene. When C becomes aware of the fact that the situation (in front of potential hearers who are well respected or older) is likely to escalate, (s)he intervenes by saying “aupitishake maneno!” [you have to let things go/pass! ], which can be understood as an encouragement to change the topic and postpone the delicate discussion, whereafter the speakers usually laugh and potential hearers are distracted and turn away. This is a common redressive action, which occurs often in Kisangani but is not mentioned by Yahya-Othman (1994) for ECS. Typical vijembe, in Kisangani usually labeled as libangá (Lingala ‘stone’) may in the case of Kisangani Swahili be situations where three male speakers meet and speaker C is clearly intoxicated, and addresses older family members while drunk. Speaker A wants to warn him and criticize his behavior but it would cause shame to do so openly, so he criticizes B by saying “unaona kukunya malofu aiko muzuli, batu bengine apa banasema mingi” [you see, drinking alcohol is not good, other people here are talking too much], which would be understood by all hearers and would help to de-escalate the situation. The fact that speaker A realizes the severity of the problem and the endangerment to the group face will be honored by the older family members who will not necessarily focus on the misbehaving speaker C any longer. Another example would be the encounter between three people who sit at the dinner table and eat together. One of the three “mange d’une façon très sale” [eats in a very dirty way] by spilling food, dirtying the table and disturbing others with too much noise, when a fourth person arrives who joins the others. The fourth person (speaker D) exchanges meaningful looks with speakers A and B, and when invited to the table, says “sitakula na niye, ju mwengine anakulaka buchafu” [I am not going to eat with you, because one is eating in a very inappropriate/dirty way]. When speaker C becomes aware of the embarrassment of speaker D’s face-threatening act and of the potential loss of group face, he gets up and asks speaker D “unamuambiya nani?” [who are you telling this? ], whereupon speaker D replies (in order to restore the group face and maintain eshima) “sikukuambiya, ezá ‘libangá’, iko libangá, kama ilikuguza, sais que ilikuwa weye” [I did not address you, it is a ‘stone’ (Lingala), it is an innuendo, if it affects you, you know that it was you]. This incident, narrated by Trésor Alembe and based on a real situation, shows that group face is saved by (a) the violation of Grice’s (1975) maxims, since speaker D states that the criticism was not directed toward speaker C, which violates the principle of truth in an utterance, and (b) makes use of several languages at once (Lingala, French, Kisangani Swahili) when confronting speaker C with the fact that it might have been him if he relates the innuendo to himself. The use of Lingala (“ezá libangá”) [it is a stone] at the moment when speaker D deliberately endangers group face by pointing out speaker C’s mistake in order to make him realize his wrong behavior and to end the delicate discussion in public, can be understood as a very emblematic act of translanguaging, and is based on the ideologies and associations that speakers relate to the use of Lingala. In the present situation, the use of Lingala (as a language which allows very direct criticism) allows speaker D to speak more frankly than the use of Kiswahili (as a language with more indirect criticisms) would imply. The fact that speakers use both languages in conversations can therefore also accord speakers more freedom, since they know that the use of Lingala comes with different pragmatic patterns of politeness. Hearers will thus not be shocked or confronted with face loss to the same extent when witnessing the violation of linguistic taboos and/or respect in Lingala, as would be the case in Kiswahili. Speakers are fully aware of the different pragmatic systems of the two languages and can, reflecting the creative use of their linguistic choices, make use of either of them when a specific situation requires more positive or negative politeness in order to save face and re-establish adabu (‘good manners’) within a community. Yahya-Othman (1994) also discusses the question of whether the speaker or the hearer has more responsibility when it comes to redressing actions of (h)aya (‘shame’) between speaker A and speaker B. In Kisangani, when speaker A says something shameful in public about B or toward B, such as “naliona tate yako na bandumba kule!” [I saw your grandfather there with prostitutes! ], both have to work on the redressive actions to avoid shame and to keep up group face. Speaker B can either remain silent, (s)he can laugh or (s)he can reply “minasikiya… aitafanya kitu” [I see… (literally ‘hear’) it does not matter], whereby (s)he does not question the truth of speaker A’s words. Regardless of whether the uttered statement is true or not, speaker A could then – in order to attenuate shame – say “nalikuwa na kuchokoza tu” [I was just kidding], which would save the situation, however the message would have been received by speaker B. As stated by Yayha-Othman, a sentence-initial hearsay marker ati is often used in hedging expressions, as a form of FTA against the negative face of the speaker (‘it is claimed that…’) or against the positive face of the speaker (‘is it true that…?’). The hearsay marker ati is not used in Kisangani, where it only exists as a form of honorific when referring to the deceased. However, it may have originated from the coastal ati. Hearsay assumptions are generally expressed by beginning the sentence with either “nalisikiya…” [I heard…] or “banasemaka…” [they say/it is said…]; see examples 1–2. In both cases the speaker’s face is saved through the distance that (s)he establishes from the narrated incident. As described by speakers, these ways of referring to delicate incidents that you relate to others “te mettent dans une position qui te sauve” [put you in a position that saves you] due to the fact that “il y a aucune certitude si cela est vrai” [there is no certainty as to whether it is true]. In most other cases, assumptions are directly uttered. mild hints (indirect utterances that have to be interpreted as request acts). he had left in a mess the night before. S1: Pangusa mafika, uliacha buchafu juzi! S2: Tengeneza mafika ju uliacha buchafu siku ilipita! to lend her some lecture notes. S1: Unisaidiye na banote yako, jusi sikukuwa, siku balileta cours. S2: Unipe kwanja notes yako ju sikukuwa siku buliandika yao. the other teachers about the next meeting. S1: Bambiye bamwalimu tuko na makutano. S2: Ubasemeye balimu bengine makutano iko siku inakuya. A worker asks his employer for a raise. S1: Mukubwa, niko na uba upandishe pesa zangu. S2: Chef, naomba uniongezeye makuta. A policeman asks a driver to move her illegally parked car. S1: Tosha mutukali yako pale, unatiya mubaya! S2: Kijana, tosha mutukali yako! not to cut off electricity, even though he has not paid his bill. S1: Ushinikatiye kwa courant, shiyapata franga ya kulipa! S2: Usinikatiye kwa courant, ata ivi siyalipa. homework assignment which he has not yet completed. Unisaidiye uniongezeye wakati ya kufanya ile devoir. S1: Unipe kwa wakati ya kundika, siyamaliza. S2: Unipe wakati nimalize kitu niko na andika. lecture [assignment, A/N] earlier than originally scheduled. Ujikaze urudishe devoir yako mbele ya wakati. S1: Nipe ile kazi na wakati sana! S2: Unipe kazi uliandika mbiyo sana. suggesting what each of them should bring. ju mayi ya lake inasamukishaka. S1: Miye, nitakuya na mayi, we utakuya na jus na fruit. S2: Miye nitakuya na biscuit, nataka weye ukuye na pomme de terre. A child asks his mother to buy him a toy car. S1: Mama, uniuziye jouet ya ile mutukali ya kidoko. S2: Mama, nataka uninunuliye mutukali ya kidoko. A mother asks her daughter to tidy up the house. S2: Mutoto yangu, tengeneza nyumba! A man asks his neighbors for a ride home. Unisaidiye unifikishe mu ville/unipe lifti. S1: Unapasha nisaidiya kunibeba/kunipeleka ku nyumba? S2: Unipeleke apa mbele kidoko. The analysis of the data provided in Table 1 reveals that in most cases similar strategies are employed in ECS, Kivu and Kisangani Swahili. Sentences 1–3 in Kisangani and Kivu Swahili make use of the first strategy (‘mood derivables’) since they function with imperatives or subjunctives (that then serve as adhortatives), which is identical in ECS. Sentence 4 in ECS shows a preference for ‘explicit performatives’, which is also realized by one of the Kisangani Swahili speakers. The Kivu Swahili speakers realize the sentence with a ‘hedged performative’+‘explicit performative’ and the second Kisangani Swahili speaker with a ‘want statement’, which gives a very different picture. Sentence 5 uses direct ‘mood derivables’ (imperatives/subjunctives) in all three varieties, whereas sentences 6–7 display a preference of ‘explicit performatives’ in ECS, while Kivu Swahili makes use of the more indirect ‘preparatories’ (‘help me to…’) and Kisangani Swahili shows a preference for direct ‘mood derivables’, thus imperatives/subjunctives. ECS shows a tendency to use ‘obligation statements’, as shown in sentence 8, while Kivu Swahili and Kisangani Swahili employ imperatives, i.e. a ‘mood derivable’ strategy (however, the Kisangani Swahili imperatives are more direct than the one uttered in Kivu Swahili). In sentences 9–10 both ECS and Kivu Swahili make use of ‘mood derivables’ (thus, imperatives/subjunctives), while Kisangani Swahili uses a very direct strategy (and a ‘want statement’ by the second speaker) that is not even listed by Podobinska, by using indicative mood and future tense (‘you will bring…’). This seems to be a strategy that is unique to Kisangani Swahili and is reminiscent of Lingala, where direct imperatives can also be expressed with future tense (“y’okotíkala!” ‘you will stay’, meaning ‘stay!’). In other varieties of Kiswahili, this strategy is usually perceived as impolite. Sentence 11 is realized as a ‘mood derivable’ in all three varieties, while sentence 12 is realized with an ‘explicit performative’ in ECS, with a more indirect ‘preparatory’ in Kivu Swahili and also Kisangani Swahili in one instance (and with an imperative by the second speaker). When comparing the results presented in Table 1, it is obvious that most of the strategies employed in all three varieties do not totally deviate from each other in terms of directness or indirectness, since Kiswahili is a language characterized by direct requests. However, it becomes evident that speakers of Kisangani Swahili tend to use mood derivable strategies that can be seen as ‘direct imperatives’ more often than speakers of Kivu Swahili, who employ more ‘indirect imperatives’ (see footnote 4 on the distinction of imperatives). ‘Want statements’ are quite scarce in Kisangani Swahili and ‘preparatories’ (for instance realized by using kusaidiya ‘to help’) are not used at all, in contrast to Kivu Swahili. In several instances Kisangani Swahili uses direct imperatives (without subjunctive marking in the singular form), where Kivu Swahili tends to employ the subjunctive in order to serve as adhortative (see sentences 1, 6, 7, 8, 9, 11), which differentiates both varieties. The use of emphatic negated imperatives, as in sentence 6 (characterized by the use of -shi- instead of the more polite and milder -si-), is restricted to Kisangani Swahili, which represents the speaker’s personal stance toward the hearer. In general, Kisangani Swahili is often described as ‘less polite’ by Kivu Swahili speakers due to the frequent use of direct imperatives, which can be seen as a result of ‘pragmatic metatypy’. While metatypy is often restricted to morphosyntax, the use of both languages by speakers in Kisangani has also led to metatypic pragmatic structures. Unlike Kiswahili varieties, Lingala does not differentiate between direct imperatives (V.stem+final vowel -a in the singular form), which are perceived as less polite among ECS speakers, and indirect imperatives (SC+V.stem+final vowel -e in the singular form), which are viewed as being more polite and serve as adhortatives due to the use of the subjunctive mood. In Lingala, only optative forms (which are not directed toward the hearer’s action or to encouraging him/her to carry out a specific action) are formed with the subjunctive. The range of greetings and social registers in which Kisangani Swahili speakers are able to interact is presented in the following chart. It is evident that especially for the case of so-called ‘honorifics’, modes of address that are directed toward people with a higher social ranking than the speaker himself/herself, there exists a very limited pool of possibilities; ECS and Kivu Swahili, in contrast, reveal more forms for politely addressing respected persons (see for instance Habwe 2010 for the analysis of honorifics in ECS). Table 2 gives an overview of the divergence of greetings/terms of address when directed to inviduals of different social status. Honorifics are an essential characteristic of coastal Swahili, where they have an elaborate and very complex social function and occur in front of people’s names. However, in Kisangani they are scarce and are restricted to few conventional examples, since only muzee Louis (‘elderly and respected man Louis’) or mwalimu Faustin (‘the teacher Faustin’) are recurrent honorifics that refer to people’s age or social status. In contrast, Lingala speakers only use honorifics as an in-group marker among youths, employing for instance the French word vieux (‘old guy, elder’) to address themselves to age mates (among male speakers). Respect towards elders can only be expressed through the ordinary terms of address papá ‘mister’, tatá ‘grandparent, (male) elder’ or mamá ‘miss, misses’. There is no differentiation between ‘common’ terms of address and honorific terms. The same is reflected in Kisangani Swahili. When speakers address somebody with a higher social prestige represented by age, social positions such as family role or clan structure or through economic or professional standing, they choose from a limited pool of terms of address. For men they choose between muzee ‘elder, old man’ and papa or baba ‘father’, while for women only mama ‘mother’ is used and is not dependent on age. Teknonyms, as used in Lingala for instance in the case of mamá na bána ‘mother of kids’ or papá na bána ‘father of kids’, as terms of address are rather scarce in Kisangani Swahili and are only realized by Lingala speakers when switching to Kiswahili. These can include mama batoto (‘mother of children’) toward a woman who has several children, baba batoto (‘father of children’), or for instance terms of address such as mama Paul / baba Jean (name of the first born child). Yahya-Othman has also analyzed impoliteness in Swahili greetings (2005), and concludes that greetings as part of phatic communication within communities are often prone to deliberate manipulation, modification and change, which often causes ‘impoliteness’. See also Culpeper (2011) for this concept, who states that “impoliteness often involves seeking to damage and/or damaging a person’s identity or identities” (p.1). While respectful registers that become obvious in greetings are of great importance on the coast (with terms such as shikamoo, marahaba, sbalkheri, chei chei and others), especially when differences of age, social status or kinship are expressed, these are not used in Kisangani Swahili, since they are often perceived as exaggerated, old-fashioned and also associated with an Islamic identity (Trésor Alembe, p.c. March 2015). However, greetings are obligatory among individuals of the same community, and not greeting passersby who are related or might know one’s own extended family can threaten the face of both individuals. In Kisangani, youths who did not greet elder passersby were confronted in public with “auna adabu!” [you do not have good manners! ], and the entire community would begin to badmouth the ignorant youngsters, by uttering “ule mutoto, aana adabu!” [that kid has no good manners!]. While interactions between young and old people of the same extended family are usually very strictly organized on the East African coast and in the Kivus, and bound to very formal communication (Paulin Baraka Bose, p.c. 2015), the interaction between grandchildren and grandparents in Kisangani is more oriented toward the capital Kinshasa, and thus very loose and informal. Speakers would therefore explain that one’s grandfather can be addressed with “Tate, habari yako? Wakuwa na ngufu, leo nitapikana na weye!” [Grandpa, how are you? Be strong, today I am going to punch you! ], whereas the grandparent would in most cases be amused about the degree of informality and would reply with laughter, and often exclamate “Pima tu! / Pima, utaona!” [try! / try and you will see!]. The following symbolic fight, where the youngster may approach the grandfather boxing him softly and touching him, will often be the starting point of a joyful conversation (Léon Moka, p.c., July 2014). This scenario is absolutely unthinkable in Goma or on the Tanzanian coast (Yahya-Othman 2005), where greetings and adabu can rarely be expressed through joking relationships as described for Kisangani. This also implies, for the conversational frame in Kisangani, that the high degree of positive politeness in joking relationships among grandchildren and their grandparents allows the younger speaker to start the conversation. Kisangani Swahili speakers would claim that the loose greeting patterns within the family context are mostly due to “Lingala et l’effet que le Lingala a eu à Kisangani” [Lingala and the effect that Lingala has had in Kisangani] (Léon Moka, p.c. July 2014). In public, a younger speaker would usually simply utter “habari?” wait for the elder speaker to reply, and then to lead the conversation. Within the Kiswahili-speaking areas of DR Congo, there are several salient differences in relation to the interpretation of adabu and eshima. In Bunia for instance (where Bunia Swahili is spoken, see Nassenstein 2017, Dimmendaal & Nassenstein forthcoming), younger speakers will never shake hands with a respected or elder person. Instead, they have to use their shoulders which are supposed to touch each other slightly. One speaker narrated an incident which occurred in Bunia, where a speaker of Bunia Swahili quickly intervened (and offered his shoulders to greet him) when a young man from Kisangani tried to shake hands with an elder man in the family context at home, whereupon the elder commented: “uyu mutoto anayua gisi banasalimiyaka bakubwa!” [this child knows how they greet respected people!]. Other conventionalized terms that are recurrent in verbal interaction in coastal Swahili culture (see Habwe 2010), such as pole as a modal particle that expresses pity and empathy when somebody is in pain or facing difficulties, are quite rare in Kisangani. The modal particle pole can be used in very specific situations, for instance when expressing condolences or when feeling sorry for someone who is tired after a long journey, but not as often as on the Tanzanian coast. The term tafadhali (‘please’) is not used at all and would lead to the reply “tu n’es pas de Kisangani, tu viens du Kivu!” [you are not from Kisangani, you must be from the Kivus! ], where this is frequently used. The coastal term kwa hisani yako (‘with your kindness’) is not used either, and when begging for something “pardon, pardon...!”, which is an example of positive politeness derived from Lingala, would be the suitable equivalent. When apologizing, a single “pardon!” [sorry] is used, while speakers of Kivu Swahili at times employ “masamaha!”. Abo banakuwaka kwanza na kitu kenye – kwetu – tunaitaka ‘lingala ni langue impolie’. Kwetu njo gi(n)si tunasemaka, kwa ju tunasemaka mu lingala kuko ma-bitu bya politesse byenye habikuwake kule mu swahili. Mu swahili kuko manière yenye una(w)eza fika mbele ya baba yako, haiko baba yako njo utaanja ongeyaongeya bitu benye abina mana. Mais kule Kinshasa unaweza sikiya muko na télévision ku salon, garçon wa kwanza anakuya na barafiki yake, na papa iko pale, iko na kula, banaona télévision, wala banaanja discuté. Mais ku Nord-Kivu, kama papa iko na ikala ku nyumba, wala ata kama iko papa, kama unaikala kwangu, unanikutana miye mwenyenyumba minaikala ku salon, utaikala inje. Ile ka-politesse baliitufundishaka. As discussed in this overview paper, Kisangani Swahili speakers’ pragmatic language use deviates to a great extent from coastal Swahili (ECS), and has adopted certain features from Lingala, marking speakers’ deliberate choices and also extending the degree of variability in complex pragmatic situations, where ‘face’, one’s public self-image, is threatened. The impact of Lingala becomes obvious when analyzing politeness strategies, the formation of directives and greetings and the use of honorifics, all of which reveal that only a few underlying foundations of Kiswahili politeness, namely adabu (‘good manners’) and eshima (‘respect’) are still considered core elements of ‘polite speech’ by Kiswahili speakers, regardless of their social status, background, socialization with Lingala or age. Thus, the analysis of Kisangani as urban space leads to the conclusion that the convergent patterns between the pragmatic principles of Lingala, the symbolic language of worldliness, fashion and urbanity, and Kiswahili, the language of ‘politeness’, traditionalism and symbolic of the eastern parts of the country, have merged in a new pragmatic frame, which is neither equivalent to coastal patterns of pragmatic language use nor to Lingala patterns as realized in the capital city Kinshasa. Moreover, it becomes obvious that the choice between being direct in verbal utterances (and thus, using the positive politeness found in Lingala), or being indirect in interaction (thus, making use of the less positive politeness in indirect Kiswahili utterances), are creatively used by speakers according to their social needs and according to the severity of (group) face threat. It is not only Kiswahili speakers who are aware of these ‘pragmatic registers’ and choices but also Lingala speakers who reside in Kisangani, and who reveal similar repertoires. It can therefore be hypothetically claimed that the city’s boundaries frame the pragmatics of politeness in Kisangani, but that a speaker’s repertoire (and its pragmatic use) is not solely based on the language with which (s)he was first socialized or which (s)he has acquired at home in a family context. In forthcoming in-depth studies that focus on the pragmatics of peripheral Kiswahili varieties, politeness should definitely be included. Variation and change in Congo Swahili varieties should therefore not only be addressed from a morphophonological or morphosyntactic perspective but also include socio-pragmatic and politeness-related research questions. ‘Impoliteness and entertainment in the television quiz show: The Weakest Link’. Journal of Politeness Research 1:35–72. This paper is an adapted version of a previously published book chapter, found in Nassenstein (2015), elaborated upon this previously published study and changed in length and content. I thank the publisher LINCOM Europa, specifically Ulrich Lüders, for their kind permission. Moreover, warm thanks go to Mary Chambers for proofreading most of the manuscript and to the anonymous peer-reviewers for their comments and ideas. Paulin Baraka Bose, Trésor Alembe, Léon Moka and their friends are warmly thanked for their collaboration and the interviews during my research on the Kiswahili spoken in Kisangani. I am grateful to Monika Feinen for the drawn map. Throughout the paper, the term Kiswahili serves as a general language name including all of its dialects, ECS represents the standardized variety from Zanzibar, while the shortened form (Kivu/Kisangani) Swahili relates to ether local varieties of the language or serves as a reference to culture and society. While Ross (2003:183) describes metatypy as “[the] kind of change that occurs in open but tightknit polylectal communities” as a (morpho)syntactic phenomenon between two languages, this can also be applied to pragmatics in cases where languages spoken in a single city reveal divergent politeness strategies, as in the present case. This is the common designation for inhabitants of Boyoma, a colloquial label for Kisangani. S<H: speaker stands hierarchically below hearer, S>H: speaker stands above hearer, S≙H: speaker and hearer are potentially on the same hierarchical level. For direct imperatives exclamation marks are used, for adhortatives they are not. All prohibitives are marked with exclamation marks. The use of so-called ‘performative verbs’ such as kuomba ‘to request, to ask for’ is not explicitly marked. The differentiation among the above listed construction types is not made by Podobinska since both direct imperatives and adhortatives are treated as “(1) mood derivables” (p.108) in her study since they work either with imperative or subjunctive forms (which then serve as adhortative or optative). In Kisangani Swahili, the differentiation of the latter becomes meaningful if we want to analyze the influence from Lingala, where only direct imperatives exist (and where the subjunctive mood is not used in order to express imperatives).